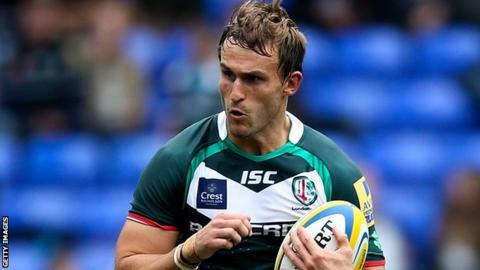 Andrew Fenby's hat-trick against his former side helped London Irish thrash fellow strugglers Newcastle. Irish ran in six tries in a first-half demolition - three for winger Fenby, a Falcons player in 2009, and one each for Fergus Mulchrone, Eamonn Sheridan and Gerard Ellis to lead 40-12. Rory Clegg's four pinpoint penalties were the only positives for Falcons. The second half proved to be more low key with neither side scoring, but the Exiles ended a four-match losing run. The result keeps bottom side Worcester's faint survival hopes alive, with a seven-point gap separating them from 11th-placed Newcastle - without a win in the Premiership since beating Irish at Kingston Park in October. London Irish, who had lost their two previous meetings with Dean Richards's side this season, made the breakthrough after just four minutes when Fenby touched down after Topsy Ojo intercepted a loose Jamie Helleur pass, with James O'Connor adding the extras. And despite Clegg getting his side on the scoreboard with the boot shortly after, the fly-half saw his clearance from the restart charged down by Mulchrone, who duly touched down for the Exiles. Fenby then scored his side's third try in 14 minutes after another Clegg penalty, using a dummy to burst through the Falcons defence with ease. Clegg continued his good form with the boot to keep the visitors within touching distance of their hosts, twice scoring straight through the posts. But the Exiles took the initiative and punished a leaky Falcons defence, first getting the bonus-points try through Eamonn Sheridan before Warren Fury was stripped by Blair Cowan, whose offload to Fenby allowed him to drive home from 30 yards. On the stroke of half-time, excellent work from Ojo and Mike Mayhew then allowed Gerard Ellis to cross over, and when O'Connor converted to make it 40-12, Irish looked like they would run away with proceedings. However, Newcastle improved greatly after the break and came close to scoring their first try of the afternoon on 68 minutes Ryan Shortland, but he was bundled out of play by Shane Geraghty as the visitors suffered their 13th straight league defeat. "We definitely got a flyer, with charge-downs, but I'm pleased we went on with it. "I'm actually happier with our second-half performance as we put in a massive defensive effort not to bleed a try or two, which is difficult when you are that far in front. "We are safe but can't get in Europe so it's an unusual situation but the signs are good as we are working hard for each other. "To lose James O'Connor with a hamstring problem 10 minutes from the end was a blow. We will have to assess him but Tom Homer is a ready-made replacement should we lose James." "It was incredible, we lacked any composure or intensity. "Some of our boys thought we were already safe from relegation, we conceded the first three tries through our own mistakes and were always chasing the game. "I made it perfectly clear what I thought at half-time as the boys knew they played badly. "In the second half there was a lot of endeavour but we still lacked structure and composure." London Irish: O'Connor; Ojo, Mulchrone, Sheridan, Fenby; Geraghty, O'Leary; Parr, Mayhew, Halavatau; Skivington, Rouse; Cowan, Ellis, Treviranus. Replacements: Dorrian for O'Connor (68), Lewington for Ojo (62), Allinson for O'Leary (50), Stevens for Parr (50), Yapp for Mayhew (50), Hagan for Halavatau (50), Evans for Ellis (62), Gough for Evans (74). Newcastle: Cato; Shortland, Helleur, Smith, Sinoti; Clegg, Fury; Shiells, Thompson, Tomaszczyk; MacLeod, McKenzie; Welch, Saull, M Wilson. Replacements: Fitzpatrick for Helleur (59), J. Hodgson for Clegg (41), Blair for Fury (46), Strain for Shiells (68), McGuigan for Thompson (40), S. Wilson for Tomaszczyk (40), Mayhew for Saull (46).